A symbiotic relationship exists between the tree and the epiphytic orchid in nature which means that there are only benefits to the relationship and there is no harm involved. The orchid is unable to survive without the aid of the tree which contributes to the plant's very existence by offering it a home and safety. Over 20,000 species of orchids survive in the wild by growing on tree tops according to the University of Waterloo. The plants cling to the tree in an attempt to survive without harming their host tree in any way. By growing in the tree tops, tree branches and trunks of a tree in a tropical environment the orchid is more able to utilize the sunlight. The tree lifts the relatively small plant up off the ground and into the air so it can reach the sunlight. 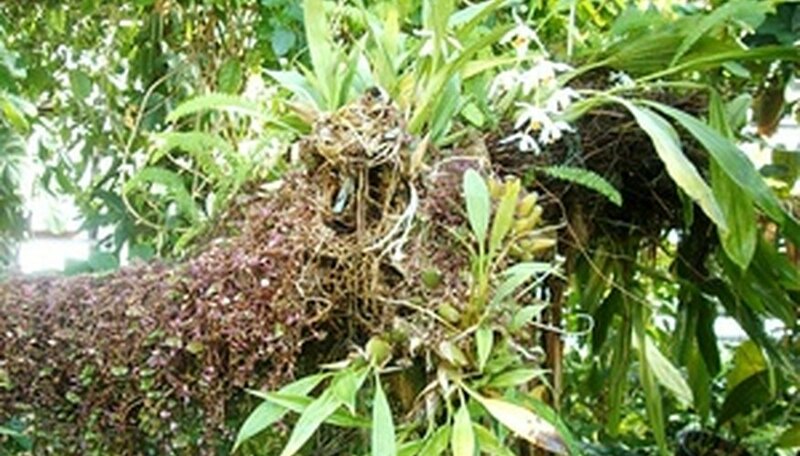 This helps the orchid survive in the dense canopy conditions of the tropical forest. The orchid spreads its roots outward along the trees surface to utilize nutrients more easily. The abundant root system that lies on the trees surface also allows the plant to more easily absorb water which the orchid stores in its secondary stems in the event of a drought. Without the covering of soil over the plants root system it is able to absorb a greater abundance of water and nutrients from its surroundings that it would be unable to do if it did not utilize the tree for growth in place of growing on the floor of the forest. Growing off the ground in the heights of a tree gives the orchid greater access to insects and animal pollinators which often come into contact with the flowers and spread the pollen readily. The wind also helps to disperse pollen for a few varieties of orchids. The orchid relies on the wind to spread its seeds. Growing within a tree allows the orchid more access for seed dispersal. Most orchids produce thousands of tiny seeds that are balloon shaped to readily catch the wind. The orchid derives its nutrients from rotting leaves that fall on the plant and also from the decomposing bark of the tree itself. During rain the tree is washed clean and this washes nutrients from the trees foliage, limbs and trunk onto the orchid so it is able to share in the bounty.